Wearable Media is the intrepid studio closing the fashion-tech gap. Our scene opens to a museum in the near future, when digital technology is all but ubiquitous to the galleries as the art they're designed to augment. As you roam the halls, scanning the rooms, you notice a fellow visitor. Upon closer inspection, you realize that their clothing is the very object being augmented. The garment is flashing with colors and images. You have never met this person before, but you’ve already gleaned an understanding about this stranger even before exchanging a word. Wearable Media, the fashion studio working towards such a hypothetical scenario, is in the business of enhancing apparel with the latest in digital technology—all while making it easier for the quotidian designer to do the same. Established in 2016, co-founders Yuchen Zhang, Jingwen Zhu, and Hellyn Teng are currently working on a high-tech, low-hassle product that can be integrated into fabric. Once secured onto the material, the device, which runs on a built-in battery, senses and responds to movement. And here's the best part: How it's designed to react is totally customizable. "The user doesn't have to program anything," Zhang told us in a recent phone interview. "All they need to do is clip the modules onto the track. They're all powered by batteries. The power clip comes as well. The modules consist of the actuators and the microcontroller, which acts as the brain of the whole system. The sensors are the eyes and nose and ears. They're all in one single pack." According to Zhang, the modules belong to a system of small electronics that can be clipped to a soft fabric connector, allowing the designer to alter the textile track and create an electronically-integrated piece. "The product is composed of LEDs, microcontrollers, and accelerometers," Zhang added. "In future lines we're expanding on the different sensors that are currently in development. 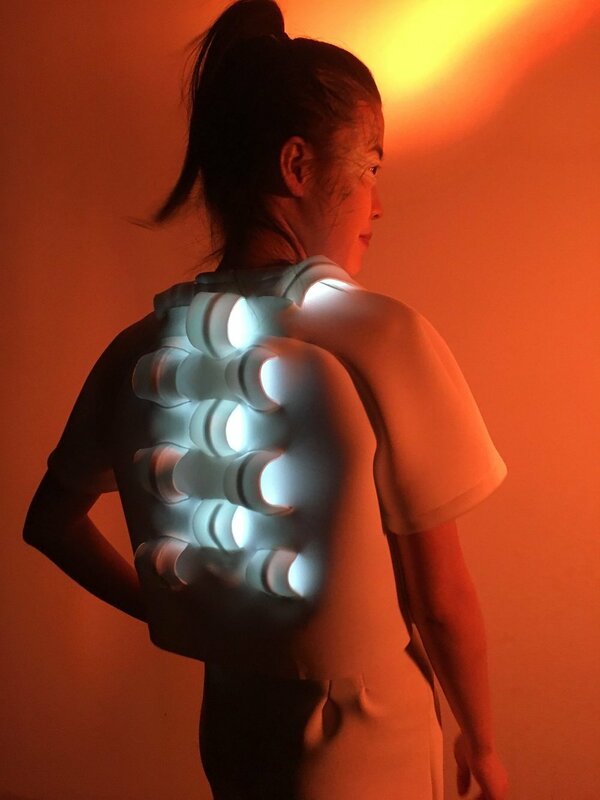 Our goal is to have any fashion designer use this tech pack and simply sew it into their garment and click on these modules we created so they can make different patterns and configurations." But making this technology accessible isn't the only thing up their sleeves. Their past works, Project Reefstone and Ceres, join a more recent project called AudRey in an upcoming exhibition at The Gottesman Libraries titled "Future Textile Library." The show, which runs from October 21 through December 22, considers "the body’s relationship to technology and design through interactive media." Like Project Reefstone, which sought to bring the wearer closer to climate concerns (both literally and figuratively) by laser-cutting the fabric used to represent the past forty years of ocean acidification in the Great Barrier Reef; and Ceres, a jumpsuit that vibrates as near-Earth asteroids pass by in real time; AudRey projects a brand new narrative layer. "AudRey is one single garment," Zhang explained. "This one is responsive to an app. To create a garment that visualizes people's social 'aura,' it's collecting social data from the users' input and then processing it as social data to make a graphic superimposed on the garment. The app itself will superimpose an augmented virtual design onto the garment." Of course, Wearable Media isn't the first studio to experiment with tech in clothing. Augmenting apparel with emerging technology has been an area of experimentation for years. Take Hussein Chalayan, dubbed the fashion industry’s “mad scientist.” Chalayan has been integrating tech into his couture for well over a decade, helping usher in a branch of fashion design we’ve come to know as ‘techno fashion.' Ann Demeulemeester is known to utilize 3D-printed materials in her products. Meanwhile, companies like Bolt Threads have altered the way we produce fabrics through bioengineering. The challenge, according to Nizen, is to create a product that makes the average consumer feel like tossing their favorite jeans away because they just have to get that new high-tech pair at the store. Successful examples of this include Uniqlo's HEATTECH jackets, and the collaboration between Levi Strauss & Co. and Google, Jacquard, which enables the roving wearer to change songs and answer calls with ease. In the case of a studio working to make the digital augmentation process easier for fellow designers, Wearable Media is on track to identifying opportunities in the industry that will continue to set them apart.